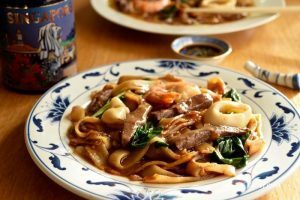 Click here to go straight to the Char Kway Teow Recipe. 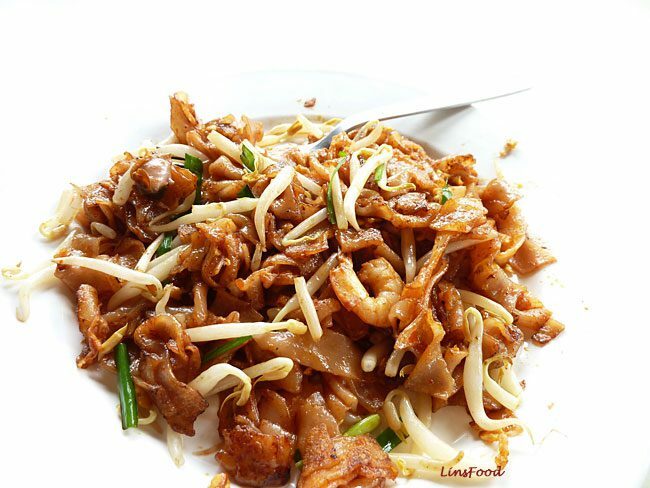 Char Kway Teow is a fantastic noodle dish, typically sold at hawker centres around Singapore and Malaysia. 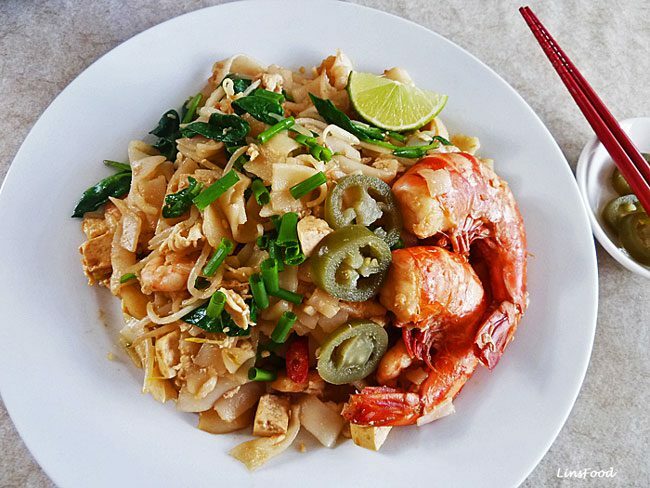 The noodles or kway teow, are flat rice noodles of about 1cm/half an inch in width, slightly wider than the more well known pad thai noodles. I’ve not come across them in dried form, I get mine fresh from the local Chinese shop. These are flat, wide and white, rice noodles, wider than the Thai noodles used for Pad Thai. Traditional hor fun noodles are pretty wide and not particularly in long strands. 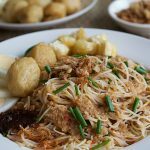 But using kway teow noodles is pretty common practice, so if you can get your hands on those, you’re off to a good start. 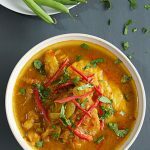 Here in the UK, the noodles come folded in packets of about 400g (14 oz) which is enough for 2-3 people depending on whether you intend to have seconds – you will! I usually soak mine in hot water for about 10-15 minutes until they’re pliable enough to untangle without breaking too much. 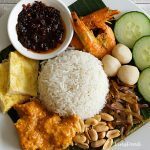 If you can’t get them, look for any type of rice noodles, the Thai ones will be a good substitute, and if you can’t get those, the thin rice vermicelli ones will have to do. And if you can’t get any rice noodles? Well, beggars can’t be choosers and all that, grab what you can, and you will still get an awesome noodle dish! 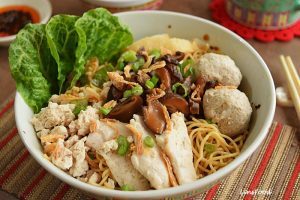 There are similar types of noodle dishes found in the region using yellow egg noodles, but those will have to be recipes for another time, eh? You can add whatever you feel like adding: seafood, meat, chicken, tofu and you can also keep it strictly vegetarian. These noodles are quite often made with fresh cockles although various other types with beef, chicken or seafood are very popular too. The flavour comes from the filling you use, the garlic and the sauces. One of the things to remember is to get all the ingredients ready but I guess this principle ought to be standard for everything! The actual cooking is very quick, the noodles are cooked on high heat and everything is constantly moved around. 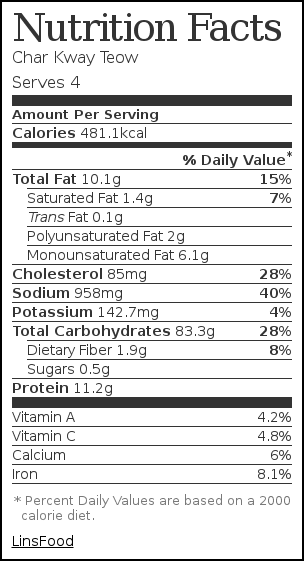 Another easy thing to bear in mind is the amount of “filling”/meat you use. Generally, a total of 2 handfuls per diner is perfect, not counting the tofu or egg that goes in. For example, in this recipe, I’m using a handful of prawns and a handful of fish balls per person. This is true for most of my noodle recipes. 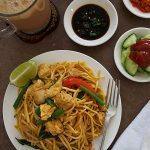 Quick and Easy recipe for Char Kway Teow, a Chinese Fried Flat Rice Noodles, found and loved all the way from Penang down to Singapore. Heat oil in a large wok over high heat, when hot, add garlic and fry for 20 seconds. Add the seafood, beansprouts, tofu and the sauces and stir vigorously for about a minute to allow the prawns to start cooking. Keep stirring things around. When prawns are almost cooked, push everything to one side and add the eggs. Let set for 20 seconds and stir slightly, set another 20 seconds to achieve a soft omelette, then add the noodles & chilli paste/red chilli. Bring everything together, mixing it all up thoroughly. Make sure prawns are cooked, check the seasoning and serve, scattered with the chives. You can have some jalapeños in vinegar in a tiny bowl on the table for each diner to add to their noodles as a condiment.